Rafe Angelito thought he was done with the demons from his past—until his son is kidnapped. Blackmailed into abducting an American heiress, the legionnaire soon finds himself trapped in paradise with a fiery, daring beauty who's nothing he expects…and everything he desires. But when he uncovers her own dark secret, Rafe realizes he's made a critical mistake—one that could cost him everything. There are several popular bestsellers in the crime writing world, including Lisa Gardner, Tess Gerritsen, and Tami Hoag, who began their careers writing romantic suspense and romantic thrillers before turning more and more to the 'dark side'. 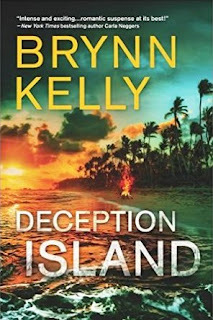 Brynn Kelly (a pen name for a Kiwi journalist) treads those same borders between the world's two biggest genres in her debut novel, Deception Island. So much so that there are two different covers for this book, one that's more 'thriller-y' (above) and a paperback version that's more 'romance-y'. 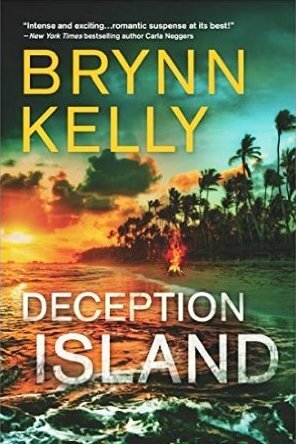 As a crime reader but not a romance one, I wasn't quite sure what I'd think of Kelly's debut, or how she'd blend what the differing audiences might enjoy, but overall I thought Deception Island was a smoothly told tale with plenty of action, and some heat. It was a good solid read, a very promising debut. Kelly clearly has storytelling chops, and drops us straight into a fascinating situation, as Rafe, a French legionnaire with a murky past is forced by figures from his past into kidnapping a woman, only for plans to go haywire when the woman isn't who she seems. There's lots of nefarious things going on behind the scenes, and Rafe and Holly have to walk a tightrope in relation to each other, as well as various figures who're using them as pawns. Deception Island kind of blends an action-packed jungle thriller, with lots of conspiracies and murky goings-on, with an unlikely slow-burn romance between two leads that are thrown together because of others, and have to work together even if they don't trust each other. In a way, it reminds me a little of the movie Romancing the Stone, with some swashbuckling action, a little humour, and a couple of interesting main characters who are put under pressure by challenges external and internal. Like that movie too, it's best to just park your disbelief, and enjoy the unfolding tale for what it is. The action ebbs and flows, but overall Kelly held my interest throughout, and I thought the 'romance' aspects were handled pretty well, without overwhelming the thriller story. I can't speak for readers coming from the romance spectrum about whether for them there is too much or too little 'heat' and romantic action between Rafe and Holly. But I note Kelly recently won a couple of romance writing awards for Deception Island, so it must have impressed those romance-minded judges. A good, exciting read with plenty to hold your attention, whatever 'genre' you enjoy.